VS Textile Mills, after getting the very good response from its volume 1 and volume 2 from its prestigious customers. 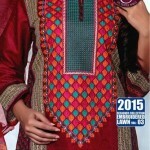 Now the brand going to introduce third volume of its spring summer embroidered lawn collection 2015 for women. The collection is titled “VS Textile Mills Embroidered Lawn 2015 Collection Volume 3” that is in stores now nationwide. 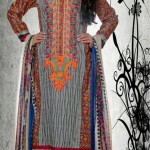 The suitable embroidered lawn dresses for women to wear on spring summer weather, girls can wear this dresses on parties, casually and formally to look attractive and beautiful. The collection is a expedition encouraged by blues scenery of the valiant designs of traditional art and light flowery patterns. VS Textile Mills Embroidered Lawn 2015 Collection includes a variety of lawn prints with the combination of fine embroidery designs. 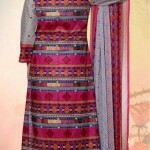 Colors palette includes such as pink, orange, purple, brown, yellow, parrot, blue, red, black, white and majenta in VS Textile Mills spring summer embroidered collection for women. 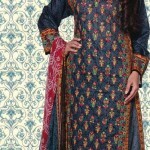 The price range of this collection is also affordable and quality of VS Textile Mills dresses are great. Comfort is a notice to feature, creativity, distinctiveness and superiority is the top priority of VS Textile Mills women wear clothing brand. 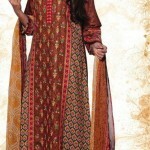 The collection consists more than twenty unique embroidered lawn designs for girls. 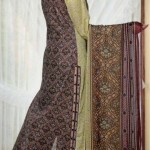 Each dress consist 2.5 Meter Chiffon dupatta, 3 Meter Embroidered Lawn Shirt and 2.5 Meter Trouser piece. Here we are going to share with our viewers, complete magazine catalogue designs of VS Textile Mills Embroidered Spring Summer Lawn Collection 2015 for ladies. Check below here new embroidered lawn spring summer designs 2015 for girls by VS Textile Mills. You can buy VS Textile Mills spring summer lawn collection from all leading stores in Pakistan, the brand also offers online order option, now you can buy your favorite dress from VS Textile Mills collection at you doorstep and pay cash when you receive dress.